Bluezone refrigeration technology allowing extended ef? cient marine transportation system can open new mar- storage periods of the organic products both aboard the kets along the Hudson River corridor of Marine Highway vessel and at the distribution centers is also employed. 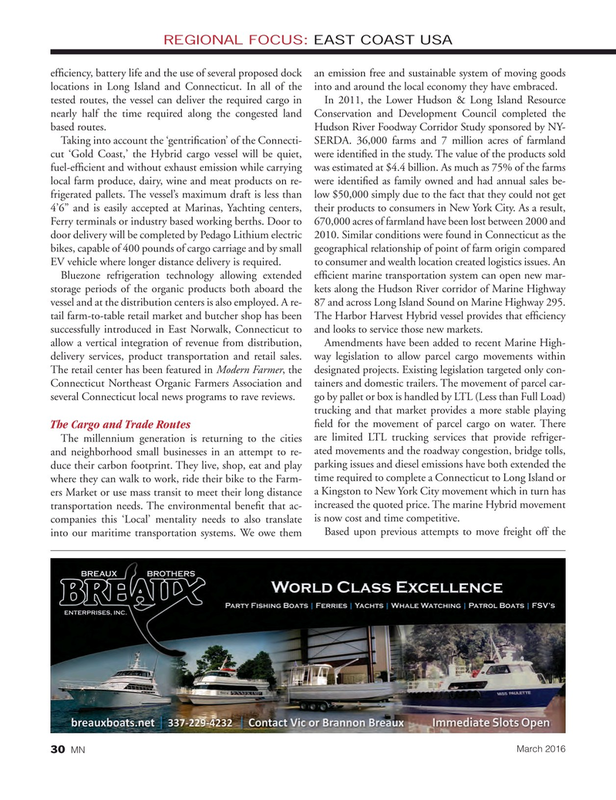 A re- 87 and across Long Island Sound on Marine Highway 295. tail farm-to-table retail market and butcher shop has been The Harbor Harvest Hybrid vessel provides that ef? ciency successfully introduced in East Norwalk, Connecticut to and looks to service those new markets. The millennium generation is returning to the cities are limited LTL trucking services that provide refriger- ated movements and the roadway congestion, bridge tolls, and neighborhood small businesses in an attempt to re- duce their carbon footprint. They live, shop, eat and play parking issues and diesel emissions have both extended the time required to complete a Connecticut to Long Island or where they can walk to work, ride their bike to the Farm- ers Market or use mass transit to meet their long distance a Kingston to New York City movement which in turn has increased the quoted price. The marine Hybrid movement transportation needs. The environmental bene? t that ac- companies this ‘Local’ mentality needs to also translate is now cost and time competitive.